I’ve always loved Chai Tau Kueh and there aren’t many places where you can find this delectable dish. 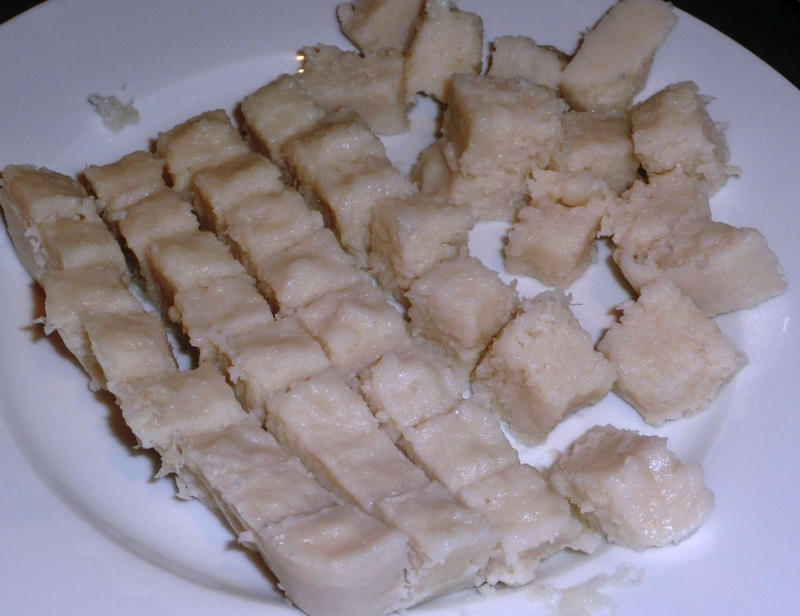 I’m of a Hokkien background and for some reason, I know this dish as Kueh Kak. The Boy however is Teow Chew (and insists that this is called CTK), so CTK is what we will go with. Apparently is a teow chew dish, and he is in the process of experimenting with this dish until he gets his grandfather’s recipe right. In the meantime, this is the Hawker style version (which you can apparently get in Muar [a town in Southern Malaysia]). 1)Add 3 tablespoons of water to the shredded radish. Steam radish in wok until it turns translucent. This should take 20 – 30 mins on a low flame. Take radish out and leave it to cool while you prepare the flour mixture. 2)Add a pinch of salt and sugar into your flour and mix with water. Stir the mixture thoroughly to remove any lumps. 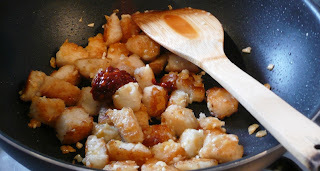 3)Combine the radish with the flour mixture and mix thoroughly. 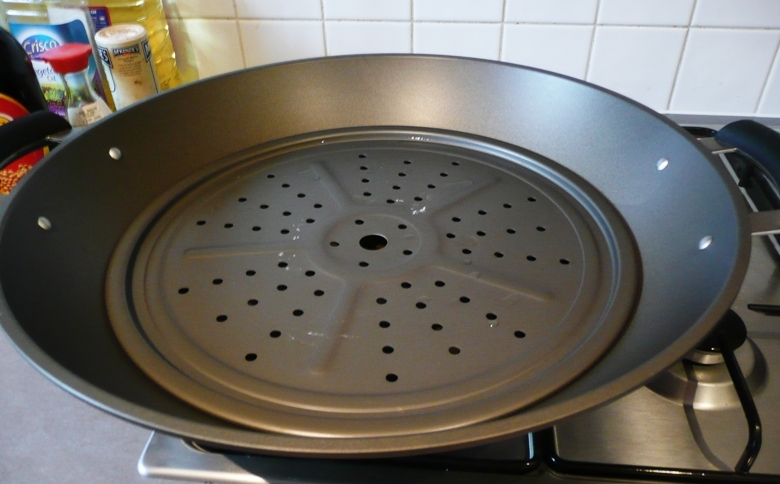 4)Pour your final mixture into a round cake tin (we used a square cake tin instead) and steam in wok for 30 – 35 minutes over a medium-high flame. 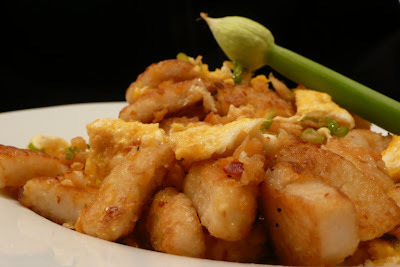 5)Take the radish cake out and leave it to cool for a few hours. This should give it a better texture. 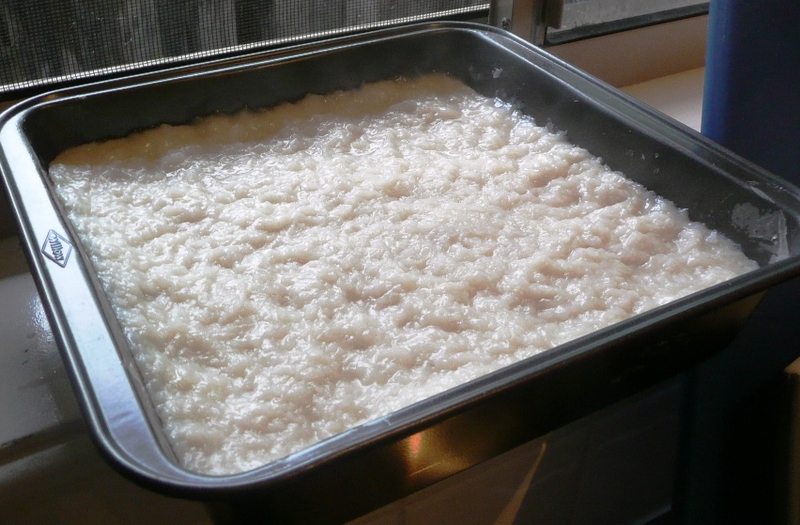 6)Once the radish cake is cooled. Cut out 1 quarter of it and keep the rest in the refrigerator. 7)Cut the quarter into smaller chunks (cubes). 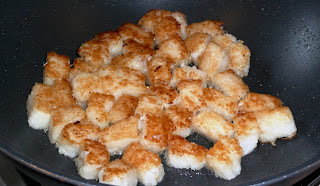 8)Use a non-stick pan to prevent the cubes from sticking onto your pan. You would’ve most probably figured it out by now that they tend to be a little sticky (when you were cutting them into chunks earlier). 9)Heat oil and add your radish cake. Fry till the edges are brown and crispy-looking. (If you prefer a crunchier texture on the outside, leave it to brown further). 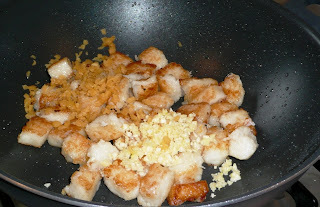 10)Add in garlic, lap cheong and preserved turnip. At this stage, you might find that the pan is a little dry. If that’s the case, add another teaspoon of oil. Fry till garlic is fragrant. 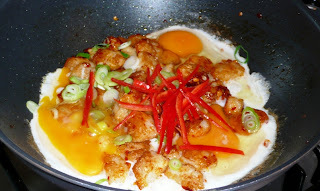 11)Now, add the chilli paste. Stir thoroughly and add the egg in. Add the fish sauce and a dash of pepper. 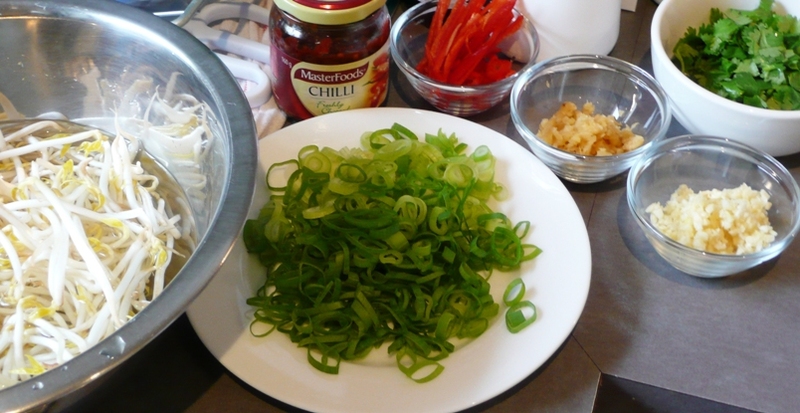 Toss in the sliced chilli and some spring onions. Fry till the egg cooks. 12)Add the remaining spring onions and bean sprouts in and turn the flame off. Give a quick stir before plating up. So whether you prefer it all on it’s own with no other ingredients…as below in all it’s glory! 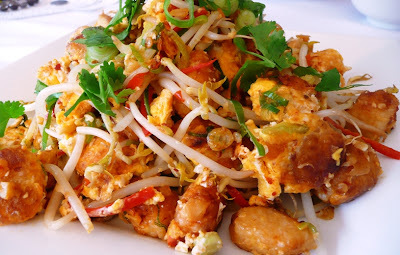 Or with a few lashings of everything… this dish will definitely have you coming back for more! 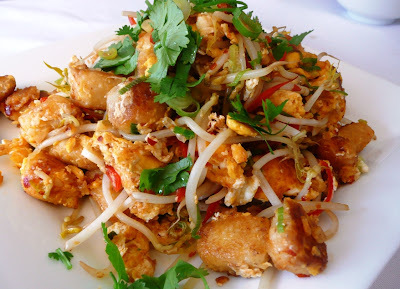 So tell me, dear readers, have you had this dish before and what do you normally cook it with? According to my mom, this dish is pretty difficult to make because of the amount of work involved in preparing it. This is very impressive! Oh wow, we have similar backgrounds! My mum is Teow Chew and my dad is Hokkien :). 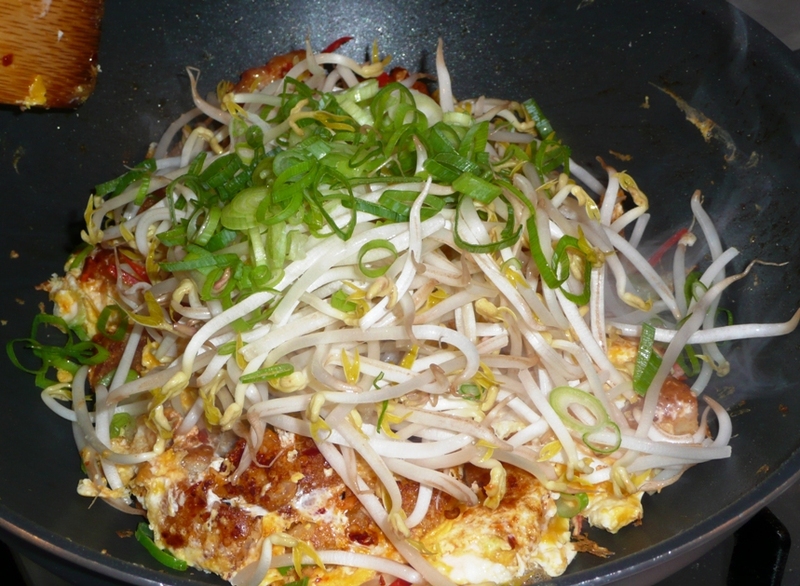 We usually put prawns, chinese sausage, egg and beansprouts in ours with a bit chilli :). We have it every once in a while at home…love it! impressive! yeh, agree this is quite involved =P. Bryan: No problem.. it's soooo yummy! 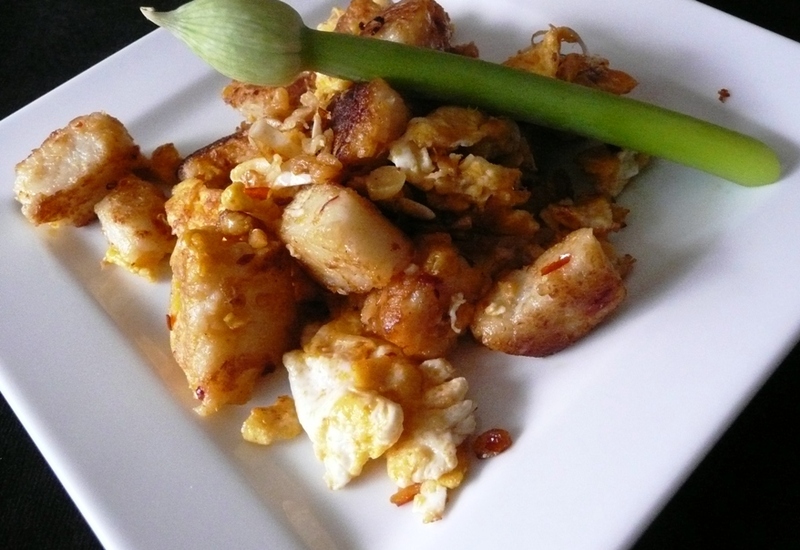 Michelle: Thank you thank you… the work is in preparing the radish cake! Opps, sorry I must have read it too quickly! I don't think we've actually prepared the radish cake from scratch so maybe we'll try that next time :). Great work! Ames: Lols… Thank you thank you! Cindy: They are the best! You need to add shallots to this dish. Before you add the sliced radish, fry some shallots in 4 tbsp of oil. Remove the shallots and add the cake. Add the fried shallots back at the end of cooking. This is my favourite breakfast. Homesick now! Shaz: Thank you thank you! I love this dish! Ellie: It's good isn't it? Nom nom nom! That looks fab. I've never cooked it before, but it does look a lot like one I ate in Muar! Will give it a go, although I doubt I'll get it as gorgeously crispy and brown like yours looks. Injera: OH yeah!! You were in JB!!! I keep forgetting.. you'd be a good taste tester!! I must remember this! A great looking chai tau kueh, good effort! If you are sending this for MMM do you mind grabbing a batch and link it back to us? Hi I-Hua, can I just say, BRAVO!!! Your CTK looks super-delicious and great colour too. Thanks for sharing. OMG I tah pau this from C&R (London Chinatown) today. Not as good as Pulau Tikus market version. Oh yeah! We make this at home pretty easily… so go replicate! As I have some radish, I check out for a CTK recipe and yours stood out. You laid out yr recipe so simply and easy to follow. I am gg to try now. By the way, can you help me connect to Little Teochew, I know Ju had closed her blog. I enjoyed all her recipes before she closed it and was sad to discover that. I did not subscribed at that time as I was new to this thing. Hope she will accept me as her avid fan, a 67 year old lady, who wants to try out some nice recipes for my grandchild.